For those of you in Singapore, BitMEX will be pitching and has a booth at the Tech In Asia Singapore conference on April 12-13. Please stop by our booth and say hello. In case you didn’t hear, the Dutch people rejected an EU – Ukraine treaty that called for closer ties. Yet, even in the face of popular disdain for disastrous policies of the EU, their vote will be largely ignored. EU President Jean-Claude Juncker said “The Commission remains strongly committed to the development of its relations with Ukraine.” [Reuters] Much like the Greeks, the popular will is discarded if the outcome is not desirable to those in charge. 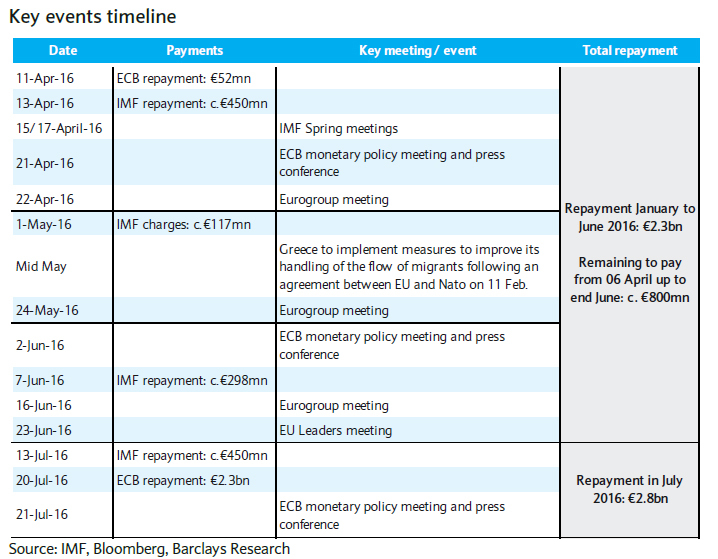 Barclays has begun the Grexit scaremongering. 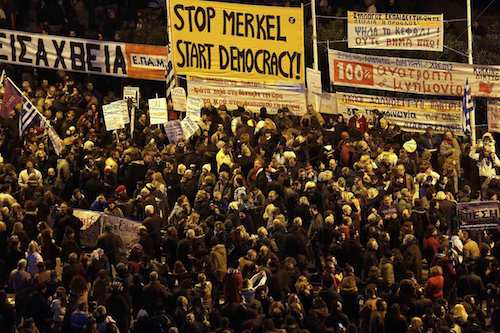 They warn that a 2016 Grexit is back on the table. The recent IMF leak didn’t do European stability any favours either. The playbook by now is very established. The Greeks rattle the cage and say they can stand no more. The ECB and Bundasbank stand firm that “austerity” must be enacted. Each side bickers, the financial markets enter risk-off to sufficiently scare the Greeks into line, then the Greeks begrudgingly accept more “austerity”. A new “programme” is put forward where the Greeks promise with all their heart to inflict more misery upon their people so that the Troika can give money to Greece, which Greece then hands back to the Troika as interest payments. The Troika gets to keep holding Greek debt at par, and the Greeks have the pleasure of remaining in the EU with all its benefits. Bitcoin will rally as the markets enter the risk-off “Oh My God! The EU is over” phase. I can just hear the benevolent billionaire George Soros chastising the Greek people for refusing to agree to his EU-centric world view. If 2016 follows 2015’s chain of events, once the Greeks cave again, Bitcoin will crash back to where it started. 2016 is interesting – a rich EU member put an EU treaty to a vote, and the result was No. The odds of Brexit are still quite low at 33%. As we approach June, many things may change. Don’t forget the ongoing migrant crisis, an attempt to find more suckers to pay into underfunded pensions for a bunch of old Europeans. Get your Depends ready, because you will certainly be babysitting Bitcoin this summer. If you haven’t seen the trailers for season 6 of Game of Thrones, take a few minutes to watch them. 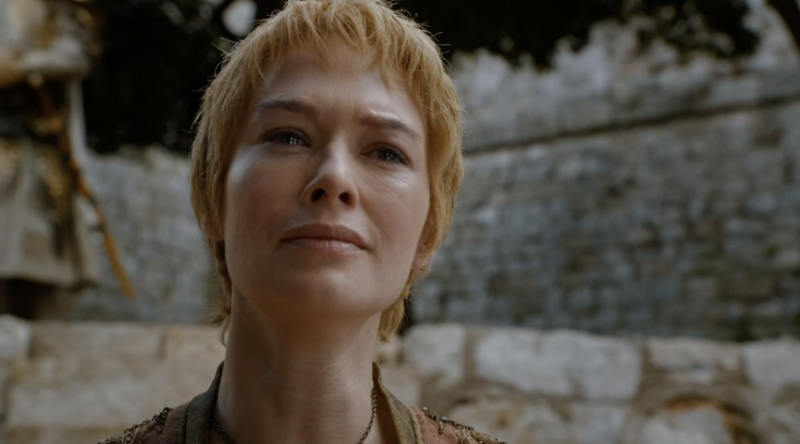 The manic gyrations of USDJPY and the pain inflicted upon traders, reminded me of Cersei’s forethcoming battle against the High Septon. Koruda-san was overjoyed that Grandma Yellen decided to begin raising rates. The Yen would be weaker, and it wouldn’t require more bullets from the BOJ. Unfortunately, the Fed has begun to backtrack their commitment to raise rates further. Currently, many traders believe a dovish Fed is back, and rates will be back at 0% or even negative by year-end. As a result, the Yen strengthened violently, and the Nikkei is crashing. Adding to the BOJ’s troubles is a populace who in the face of NIRP is hoarding cash, not spending it. More 10,000 Yen notes are being produced to satisfy the demand for cash [Japan Times]. Abe-san and Koruda-san will not go quietly. Japan is walking back its commitment not to engage in competitive devaluations [Zerohedge]. Verbal central bank jawboning is more effective than actually entering the market. Ever since the BOJ decided to go negative, they are the laughing stock of the FX community. Instead of a weaker JPY, the BOJ’s actions sparked a surge in the Yen and the amount of cash hoarded by its vassals. When the BOJ finally intervenes to trash the Yen, the success of their efforts will be short lived. As dejected traders watch carry trades explode in their faces (traders borrow Yen cheap as funding for speculative trades in other asset classes), they will have to reduce their exposure to risky assets or face the wrath of margin calls. Evidence of this is the record number of foreigners shedding Japanese equities. According to Bloomberg, foreign investors have sold $46 billion worth of Japanese equities. Japan has spent the last almost three decades fighting deflation. They will go where no nation has gone before. They are currently experimenting with fingerprint enabled cash transactions. If they can effectively ban cash, then NIRP can work its inflationary magic. Combine that with basic income, or helicopter money, and you have a recipe for toilet paper Yen. Japan’s feared housewife FX punters, the Mrs. Watanabe’s, won’t accept this theft without a fight. First the large cash safes will disappear from the market. Then they will begin exchanging their domestic toilet paper for any other currency, commodity, or real asset they can electronically. Bitcoin and digital currencies will become very attractive. Much like XBTCNY, XBTJPY is a much watch pair. The Japanese are at the forefront in implementing destructive and ineffective monetary policies. The BOJ’s desperation is palpable as they enter their fourth decade fighting the deflationary boogieman. Want to trade the Yen? The BitMEX Bitcoin / Yen Futures contract, XBJ24H, will soon be live. Using XBJ24H, traders will be able to express a pure view on Japan’s monetary chicanery. From the beginning of 2016, to it’s peak at 0.0372 ETH/XBT, Ether went up over 1,700%. Bitcoin, from the start of 2013 to its first peak of $250 in April 2013, was up over 1,900%. Ether dropped over 52% its the all-time-high (ATH) to a low of 0.0176 ETH/XBT last night. Much like it, Bitcoin, after peaking in April 2013, dropped by 80%. We all know how the story of Bitcoin in 2013 ended. There will be many traders attempting to project a similar movement onto Ether. An 80% retracement from the all-time high necessitates a bottom at 0.00744. Given the Ethereum project has much more positive press and institutional involvement at this stage than Bitcoin had in early 2013, I don’t expect a collapse to those levels. Do traders believe a repeat of Bitcoin’s 2013 breakout will occur with Ether in 2016? The Bitcoin halving this July will play a crucial role in determining Ether’s price trajectory. If the Bitcoin price crumbles due to issues arising from the halving, you can expect Ether to receive a massive boost. However, a resurrected Bitcoin will put the Ether party on hold for a bit longer. Never underestimate greed and FOMO. Many $1,000 Bitcoin bag holders desire redemption. Getting in “early” on an Ether 2016 mega bubble is on their minds. Their itchy trigger fingers might just make it happen.